The amount of time elapsed from when a camera (for example: MOULTRIE PANORAMIC 150I ) first detects motion until it captures a photo of what caused that motion. A trail camera’s effectiveness is determined by several test criteria, however, if you had to pick just one as the most important, it would definitely be “Trigger Speed”. Plain and simple, if your scouting camera doesn’t have a quick trigger, you’re going to get numerous photos with just half an animal and many blank photos with no animal at all. Trigger speeds vary from several seconds to a lightning fast 1/20th of a second. The best performing game cameras have speeds of 0.5 seconds or less. The following picture is what can happen with a slow trigger speed. We test trigger speed with our proprietary, computer-controlled testing device – The Triggernator. The Triggernator consistently moves a heat source across the face of the test camera, triggering a stopwatch at the precise instant the heat source bisects the camera’s PIR detection sensor. A photo is captured, revealing the test camera’s trigger time accurate to 4/1000th of a second. The consistency is incredible. The amount of time required for a camera to rearm itself and take a second triggered photo after the first triggered photo is captured. When digital trail cameras were first widely available, the technology was taken from the original 35mm trail cameras. 35mm film usually came with a maximum of 36 exposures per roll. Engineers at the time purposely limited film cameras to a maximum of 1 photo per minute to avoid a single animal from depleting an entire roll of film. Unfortunately, the first digital trail cameras didn’t fully take advantage of their massive (relatively speaking) storage capabilities and adopted the 1 photo per a minute recovery time. If you place a camera at a feeding station, recovery time isn’t important. However, when covering travel corridors a camera’s recovery time becomes critical. Early on we realized cameras were only capturing the lead animal when a group passed by. The situation became even more frustrating when a camera would capture a photo of a doe, but miss the enormous buck trailing the doe. We immediately placed a high priority on recovery time and encouraged manufacturers to produce models with the fastest recovery times possible. Our proprietary recovery testing equipment simulates constant motion in front of a camera. The simulated motion produces multiple photos as fast as the camera can trigger, recover and then trigger again. The intervals between triggered photos are analyzed for consistency and an average is calculated. The variance in recovery times in most cameras is negligible. However, cameras with wide variances are rejected and replacement units are retested. The maximum range at which a camera is able to detect motion and trigger a photo. Trail cameras were invented to collect information at times when humans can’t. Trail cameras which detect motion at greater distances cover more ground and collect more information than cameras with shorter detection capabilities. We’ve tested cameras with detection ranges as little as 40’ as well as some models which detect out to an incredible 120’. Trail cameras detect the presence of an animal using the differential of the animal’s body heat relative to the ambient temperature in the area. Consequently, detection range varies greatly depending on air temperature. A camera’s detection range could be substantially greater on a 32 degree winter day compared to a 90 degree summer day. We test every model on the same day at the exact same time and under the same atmospheric conditions and temperature. Specifically, a test subject walks in front of a representation of each camera included in the test at distances out to 120’ in 10’ increments. The farthest distance at which each camera triggered a photo is recorded as the model’s maximum detection range. The angle at which the PIR lens of a camera creates a detection zone. Detection angles vary greatly and there are pros and cons to using different angle producing PIR detection lenses. Narrow detection circuits (10 degrees or less) were commonly used in the first generation of trail cameras due to their lower cost and ease of design integration. Almost all narrow detection PIR lens are small, circular in shape and can be mounted on any flat section of a trail camera case. Because narrow circuits cover a smaller side-to-side area, they tend to reach out farther. The photo lens of most trail cameras is angled at about 40 degrees. With narrow detection circuits covering just 10 degrees, animals must wander into the middle of the picture frame before the camera is triggered. This combination of 40-degree photo lens and 10-degree detection circuit usually produces photos with the animal centered in the frame and almost eliminates the possibility of pictures of half animals. Consequently, a narrow 10-degree detection circuit is only covering 25% of what the camera photo lens can capture. Accordingly, many animals will wander into an area the photo lens would capture, but will not be triggered by the narrow detection zone. Wide detection PIR lenses (40 degrees or more) are most commonly mounted on a curved surface requiring a higher level of design integration. Ideally, the angle of the detection circuit would perfectly match, or be just slightly smaller than the viewing angle of the photo lens. In this scenario, a triggering sequence would only be initiated when an animal was in the field of view of the photo lens. Cameras with wide detection zones gather more information and prove to be more efficient and productive scouting tools in most situations. However, be advised there are cameras with detection zones wider than the field of view of the photographic lens. Some are the product of poor design and/or quality control, but in many cases, these cameras with mismatched components were designed intentionally to compensate for slow triggers. Either way, cameras with detection zones wider than the angle of the photographic lens trigger before an animal fully makes it into the picture frame and produce many empty photos. Using a geometrically calibrated walk area, we test the detection zone edges of every camera we review. The distance from edge-to-edge is measured and then a detection angle is extrapolated using a mathematical equation. The total area expressed in square feet which movement by an animal will trigger a photo. Again, Trail cameras were invented to collect information at times when humans can’t. 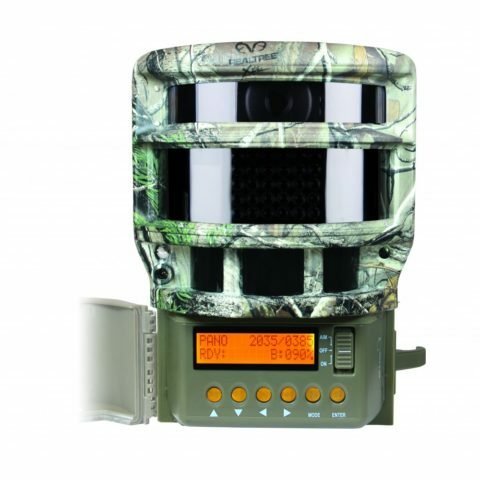 Trail cameras which cover more ground collect more information and prove to be more valuable. The data obtained from the Detection Range & Detection Angle tests is plugged into an equation and an area expressed in square feet is produced. The angle which determines the field of view of a photographic lens. Most cameras use a lens angle of approximately 40 degrees. Our motivation for testing the exact degree of lens angle is less about the lens itself, but more specifically how it relates to the detection angle. The purpose of the test is to identify models with noticeable disparities in the two angles. Test cameras are placed an exact distance from a measuring device. A photo is captured and the side to side measurement of the field of view is calculated. Inserting the two measurements into an equation produces the lens angle. A comprehensive test which combines trigger speed, recovery time and detection area to assess a camera’s ability to gather information in the field. A trail camera’s job is to gather scouting information/data when a human is unable to do so. Cameras capable of efficiently gathering more information prove to be more useful than those which fall short. The Trailcampro Detection Shootout tests all of the most critical attributes of a camera's ability to detect and gather information and combines it into one comprehensive score. A test subject walks in front of a representation of each camera included in the test at distances out to 120’ in 10’ increments. The test is performed twice at each distance with the test subject entering from both the right and left side of the frame. Entering from both directions assesses the performance of both sides of the detection zone and minimizes the impact of poorly aligned internal components. In 2015 we completely revamped the scoring system on the Shootout. Companies had been designing cameras with detection zones much wider than the field of view of their lens. This gave cameras with slow triggers a head start on their competitors and cameras with poor detection circuits were being unfairly rewarded. The current test awards a point for each full picture (greater than 60% of the body) of the test subject captured on each pass. Cameras with fast recovery times are allowed points for multiple pictures on each pass. Empty and partial pictures are also included to compute an efficiency rating for each camera. The efficiency rating is simply the percentage of pictures which captured a valid image (60% or greater) of the test subject relative to the total number of images taken (valid + partial + empty). A simple term which attempts to quantify a very complicated assessment of the power consumption associated with many functions of a trail camera. Battery life equates to many things for many different people. For some, battery life is all about convenience. Better battery life means fewer trips to a camera site to change batteries. For others, it’s absolutely critical. Scientists who can only visit a research site once every six months stake the success of their entire project on battery life. Finally, everyone can relate to the cost savings cameras with better battery life provide. It's extremely difficult to estimate trail camera battery life. Variables include number of pictures taken, percentage of day to night photos, temperature and power consumption characteristics unique to each camera. Although we can't give you the exact number of days a camera will last in your specific setting, we can provide precise measurements for power consumption. Resting current draw – The amount of power (measured in milliwatts) a trail camera requires while it is in the “ready state” waiting to trigger when the next motion event occurs. Daytime photo power consumption – The total amount of power (measured in watt seconds) required to trigger, capture and store a photo after a motion event without a flash. Daytime Video power consumption – The total amount of power (measured in watt seconds) required to trigger, capture and store a 10-second video after a motion event without a flash. Nighttime photo power consumption – The total amount of power (measured in watt seconds) required to trigger, capture and store a photo after a motion event which requires illumination from a flash device. Nighttime Video power consumption – The total amount of power (measured in watt seconds) required to trigger, capture and store a ten-second video after a motion event which requires illumination from a flash device. Using these precise measurements we insert each camera’s consumption data into an equation which extrapolates the days of battery life in a scenario where each camera takes a 35 day and 35 nighttime photos.